In this article, we are going to take a look at probiotics. By the end, you’ll know what probiotics are, whether or not you need them and, if you do, which probiotic supplement might be right for you. Probiotics are a catchall term that refers to any living bacteria that lives inside of your body, and provide health benefits when consumed. These bacteria live very brief lives in your gut, but unlike the bacteria that can get you sick, probiotics are bacteria that have a positive effect on your insides, strengthening it while they live there. Think of it like having a houseguest. Sometimes they eat all of your food and leave the place a mess, but other times they pick up after themselves and leave the place better than they found it. Probiotics are the good kind. Probiotics have been scientifically shown to treat certain intestinal health conditions so they almost certainly have a positive effect on your gut. Furthermore, gut health has been shown to be a very important factor in bodily health overall. Probiotics are bacteria, which means they love to live in things that are fermenting. Since many bacteria are evolved to live decomposing animal products, they’re often marketed as being found in things like yogurt. The truth is, probiotics can be found in a whole suite of plant-based foods. not only that, they can be found in plenty of vegan products that are readily available, but they come in all shapes and sizes. Although they are most often found in animal products like yogurt, they can also be made into some delicious, eye-popping recipes. be found in plant-based foods. Although there has been plenty of debate as to what conditions probiotic actually treat. In addition to overstated claims about probiotics, there’s also some evidence they could cause side effects, such as gas, bloating, and possibly more serious conditions. If you have reason to believe you need probiotics, and eating fermented foods isn’t really your style, you may want to consider supplements. We’ve put together this list of supplements, along with a short description, links and reviews. Happy browsing! One Amazon user says: “I’m pretty amazed at how these work. I am vegan and was unknowingly taking nonvegan probiotics, the best of the best, the kind you pay obscene amounts for, refrigerate, and have to take loyally 3x a day at least 30 minutes before a meal. They worked ok and all but when I discovered the dairy I looked elsewhere. Ora Organic Probiotic Capsules are made from organic Jerusalem artichoke and is high in fiber. This supplement is intended for probiotic users with a sensitive stomach. Soy-free, Gluten-free, and non-gmo. With a $33.24 price tag, it’s one of the more expensive options, has a 4.5 Amazon rating. One reviewer claimed to experience bloating and constipation a common side effect of probiotics. MaryRuth’s Liquid Probiotic is sourced from three different kinds of probiotic grasses. Nut-free, soy-free, gluten-free, and corn-free. With a price tag of $42.70, it’s one of the pricer options out there, but no pill is required. It has an excellent Amazon rating. Kristina says: “I noticed that low and behold – this wonderful company also offered a liquid probiotic. I was excited – and scared. I’ve never had a liquid probiotic and I’m pretty sensitive to taste but based upon my love for the liquid morning multivitamin, I ordered this. Active Acidophilus Probiotic contains over 40 million microorganisms. Gluten-free and soy-free. Meant for gastrointestinal relief. Designed to be non-daily in order to be gentler on those who regularly suffer side effects of other probiotics. $14.99. Probiotics One was ranked number 1 on the ProbioticsGuide authority blog. Supports the intestines and immune system with 6 different strains. Non-GMO and gluten-free, contains no soy, yeast, nuts, sugar, or iron. $25.00. 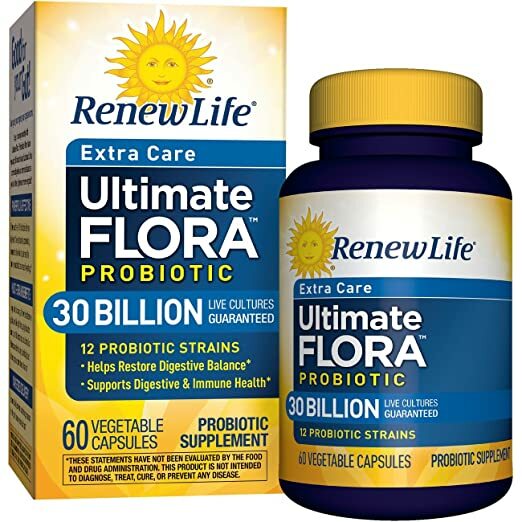 This Renew Life Ultimate Flora Probiotic is higher-strength and therefore for adults only. it contains 30 billion cultures to support your digestive and immune health.ltimate Flora Probiotic uses 12 probiotic strains to help with digestion. at 30.77, it’s on the higher end of the price range. As we mentioned earlier, humans have been getting their probiotic fix long before the invention of pills. (or gummies, for that matter) Turns out, you can prepare delicious probiotic food from the comfort of your own home. Check out the Food Monster App! If you want probiotic dairy-free yogurt without all the added sugar, give Sarah Pether‘s Homemade Probiotic Cashew Yogurt a try. While most homemade dairy-free yogurts use Thai young coconut meat, this recipe uses cashews which gives it a thick texture like Greek yogurt. After you blend the cashews you must use glass and wood utensils and bowls! No more metal! Metal will kill the nice friendly bacteria that are going to make the yogurt. Chances are when you went vegan, you might have missed the taste of cheese. But you might have also missed the probiotic! This Herbed Probiotic Cheese by Alejandra Olmedo has all the flavor of the original, with the added bonus of probiotics! Do you always order miso soup to start off your sushi outings? If so, you should definitely try Christin McKamey‘s heartier Slow-Cooker Lentil Miso Soup. In addition to miso (which is a probiotic), this flavorful broth contains ginger, soy sauce, onion, and rice vinegar. Toss all the ingredients in a slow-cooker in the morning and check dinner off your list for the day! You can find more plant-based probiotic goodness by downloading our Food Monster App, which is available for both Android and iPhone, and can also be found on Instagram and Facebook. The app has more than 10,000 plant-based, allergy-friendly recipes, and subscribers gain access to new recipes every day. Check it out!